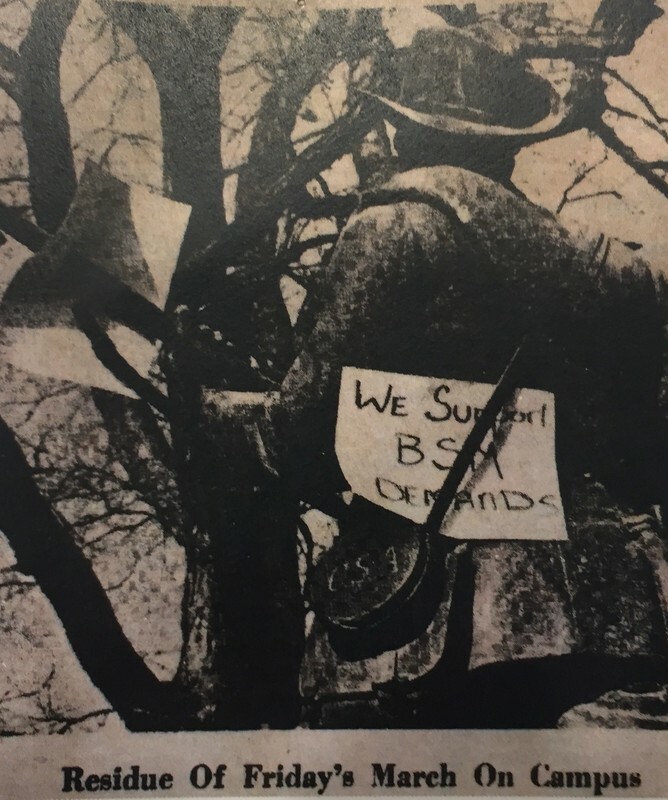 An image of the Silent Sam statue with a sign reading "We Support BSM Demands" tucked behind the strap of the cartridge case and another sign, text not visible, on the statue's gun. The caption reads "The Residue of Friday's March," presumably in reference to the 7 February 1969 rally organized by the Southern Student Organizing Committee (SSOC) in support of the Demands of the Black Student Movement, issued in December 1968. Chapel Hill News, 9 February 1969. “Silent Sam with "We Support BSM Demands" sign, 1969,” UNC Libraries, accessed April 25, 2019, https://exhibits.lib.unc.edu/items/show/5883.